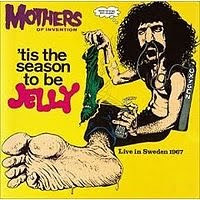 This is a bootleg of a Mothers show in Sweden from 1967, and one of the more common ones you're bound to see. Not sure when it was originally bootlegged, but it's been around for a long time in one form or another. In 1991, Zappa, tired of all these random bootleg recordings floating around (without any compensation on his end), collected the most common ones and released them through Rhino as the Beat the Boots box. (They were also released on CD.) The copy I have is from that era, and it must have been released on its own (not in the box set), because I can't believe anyone in their right mind would break up the box. Beat the Boots is on my list of Zappa LPs to buy, but it's quite expensive if you can find a decent copy with everything intact. So, I've been putting it off. As of right now, I have two of the LPs from the box, but I want the whole damn thing in its complete form. Someday. So, like I said, this show is from Sweden in 1967. The date is often disputed, but it's commonly listed as September 30. It's a great (and most likely incomplete) show, with the Mothers doing a nice variety of stuff. The first side features a waltz version of "You Didn't Try to Call Me," along with a fairly straightforward take on "Big Leg Emma." There's also short bits of such rock classics as "Baby Love," "Blue Suede Shoes," and "Hound Dog," along with a few other random pop songs. The second side is comprised of two songs: A seventeen-minute version of "King Kong," and a strangely faithful-to-the-album version of "It Can't Happen Here," or at least initially. After the lyrics cut out, the band goes into noise-improv mode and it gets all sorts of weird. "King Kong" is pretty good, but the band sounds a bit directionless in certain spots. The same goes for the rest of the album. I'm not trying to say this isn't good. Any bootleg of the Mothers from this era is worth listening to. It's just that the recording's not particularly great, and the performance probably wasn't one of their better ones. I still play this record every once in a while, but I can't say it's one of my favorites. Great cover though, huh? Can't find any audio, but here's a weird version of "Let's Make the Water Turn Black" from 1967.